Over the last year I have gone from doing DVD workouts to running as a form of exercise. While I get my frustration and stress out during my runs, I feel like I need to find a way to calm myself. I have done that through Yoga. Who knew that stretching out your body could make you feel so great? Oh, of course we know that, but I digress. When you are on your way to do Yoga out of the house, or for any workout for that matter, it is easy to get a little worked up when your bag doesn't hold your yoga mat, or there isn't room for your towel, or even when you forgot to bring a protein snack for afterward. Aurorae Spa asked me to review a product for you that will help with that. The Aurorae Sport Bag is very functional. You can strap your yoga mat on it and go. You can also keep your towel and maybe a change of clothes in it for after you workout. There are quite a few pockets that you could stash a lot of things in there. The main compartment is big enough to fit even a notebook computer! This bag is very handy for me as I walk down the road a bit to do my workouts with a neighbor. 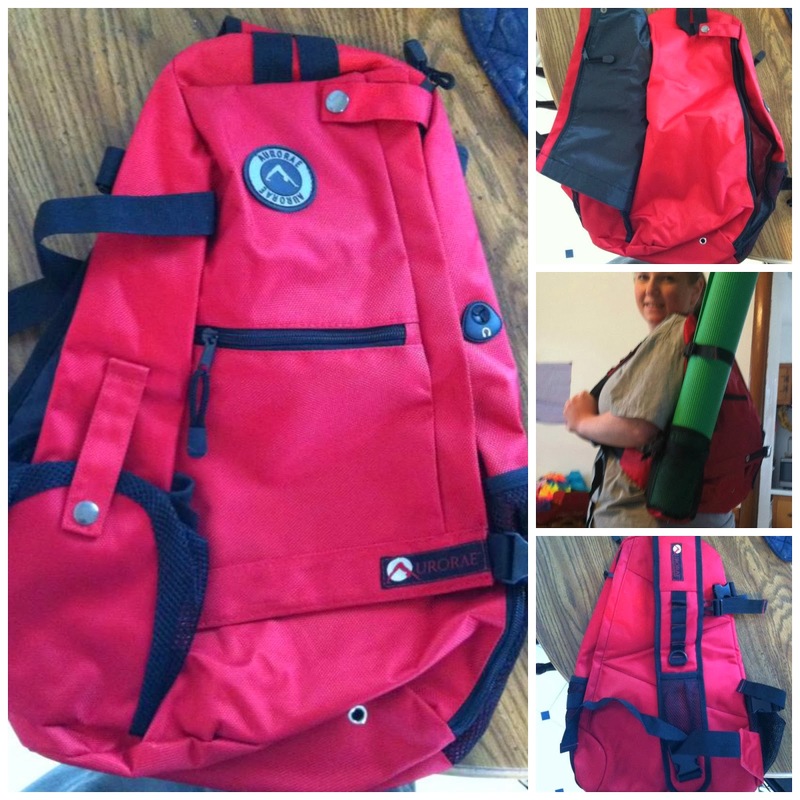 I am able to attach my Yoga mat, water bottle, towel and a snack all in one place! No more dropping my banana as I'm walking down the sidewalk! You can purchase this bag on Amazon.com HERE! 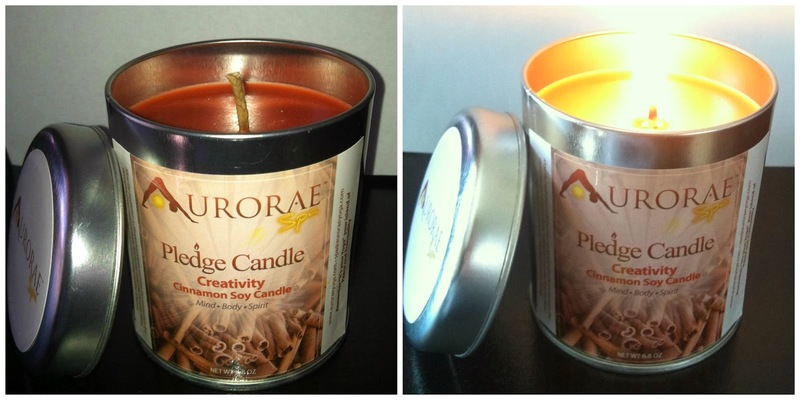 Aurorae Spa also sent me a Pledge Candle - Creativity - Cinnamon Soy Candle. This candle is 100% soy wax and is set to burn for 30-35 hours. It comes in a recyclable tin and will burn smoke free! Aurorae's collection of meditation candles come with the intention to help you concentrate on a particular state of mind while meditating. Light the candle, breathe and focus with an open mind. I had this candle burning during a Yoga workout for about 30 minutes. The whole room was filled with the scent of cinnamon and I felt ready for my day. Also a big plus was hardly any of the candle had melted in that amount of time. Soy candles are great, and this candle is nothing short of great. You can purchase this candle on Amazon.com HERE! As they say at Aurorae, "Its your Yoga", Relax and Enjoy Yourself! Disclosure: A special thank you to Aurorae Spa for giving Sweet Cheeks and Savings this opportunity to work with them. We received these items free of charge from Aurorae Spa. No monetary compensation was received or offered, nor were we under any obligation to write about this product. All opinions expressed are honest thoughts. We were not offering any sales or taking orders for this item. We will not receive any compensation in connection with any sales of this item. That bag would be a total life saver for me. I have this weirdly sized tote bag that my yoga mat falls out of all the time. I'm guessing that your house smells amazing after burning that cinnamon candle! The bag is very cute, and it looks handy. Right now, my yoga mat sort of flops it way back to the car with me! I'm sure it's a comical sight! I have been looking for something to carry my mat. This is perfect! That would even work as a gym bag! Wish me luck, I am starting my gym routine today. I bet those candles smell absolutely amazing. I've been wanting to go to a yoga class that is offered for free here but I haven't yet. This bag would be an awesome motivation! I currently use a bag that I received to review on my blog when I go to the gym. but this back looks great. And I just love candles!! I need a tote bag like this to carry my yoga mat in. I have to carry it by hand. I would love to have that bag. Wonder if they are sold in canada? I have one of their yoga mats and it's so soft and padded. I really like it a lot! Looks like a great company. I like that is all environmentally friendly. That bag really is very functional. It's good to see that they have items like this to make your experience more seamless. That is a really nice bag! Like Robin, I put my yoga mat in an over sized beach type bag, and it never stays put. I am constantly having to readjust it, and it is such a pain! I have never heard of this brand but the candles definitely caught my eye. I love the scent ideas. Looks like a great product! I've been wanting to take up yoga for a while - I need to get on the ball, I guess! I would love to have that bag. Where can I find it? This bag sure does looks handy. This is the perfect side for me. I would definitely take it with me to my yoga classes. That looks like a great bag for just about anything, from working out to hiking. The candles look awesome too! Looks great! <3 I'd love to have that candle piece at home! I really wish to have a yoga mat someday. Nice red bag to organize fitness stuff. The bag looks very functional. I am however eying the candles. I may have to get some. I bet those soy candles smell delicious. The bag looks really great too! Sounds like a great candle. I love candles that make my entire house smell great. I usually pick them up at Yankee Candle since it's so close by but I need to start experimenting with others. I love the yoga bag. I tried Bikram yoga for the first time today but had to take my regular gym bag since I don't have a super cool yoga bag. We have a lot of soy candles since we still don't have electricity. They smell amazing.